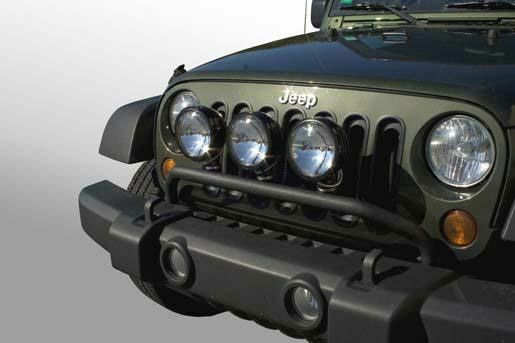 This bumper light bar (part number 123220RR) provides a mounting place for adding extra lights to the front of your Jeep Wrangler. The bar is made of steel tubing with a textured black powder coat finish for durability and good looks. There is room on the bar for up to three 6-inch or two 8-inch lights. 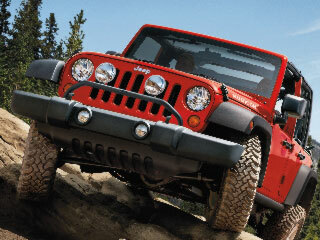 The bumper light bar mounts to existing bolt locations. Installation notes: On 2011 to 2013 Wranglers, one mounting point is blocked by a boxed stanchion. A magnet can be used to start the nut. For 2007 to 2010 models, there are three bolt holes but only the two in a vertical line are used for mounting the bumper light bar. Shipped quick with secured packaging ,item looked and felt great, very strong in its construction, easy to mount and made a big difference in appearance of jku jeep.very satisfied with this product..also prior to purchase the conversation with just for jeeps was outstanding and professional,very polite and educational.thank you staff..
Great light bar! It fit perfectly on my 2015 4-door Rubicon with the stock bumper, and it looks great and feels solid. I didn't even have to remove the bumper to mount it, although I had to remove the valence below the bumper to get access to the bolts with a wrench, but that took only a few minutes to pop the retaining clips. As a tip for anyone installing this light bar, I successfully used 18" long zip-ties wrapped around the nuts to be able to slide them down into place without worrying about dropping them into the narrow opening where they get installed. I'm wasn't sure if they would drop straight through if I lost one, and I didn't want to risk it. Also, it was tricky aligning the brackets while holding the nuts in place and starting the bolts, and it probably would have been nearly impossible without a helper. ProsGood fit, and looks great! Solid construction. ConsThe black finish it just a little bit on the glossy side, but it's not too much. I think it would look better if it were truly flat black, but the crinkled finish saves it. Don't let this stop you from buying it though. It still looks great.